All we have to do in order to use one of the default Margins, is to just click on one of the above and the Margins of our spreadsheet will change according to the measurements of the selected Margins. 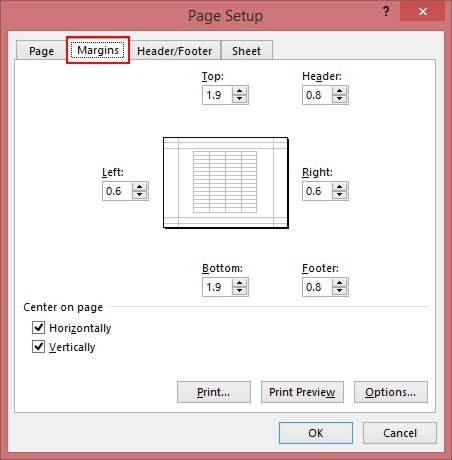 If we do not want to use one of the default Margins, but to create a Custom Margin, we just select the command Custom Margins from the drop down menu as shown above, and straight away the Page Setup dialog box appears with the Margins tab activated as shown in the image below. In this dialog box we can create our Custom Margins, just by selecting the Up and Bottom arrows next to the Top, Bottom, Left and Right commands, to the measurements that we want. In this dialog box we can also adjust the measurements that we want for the Header and Footer we need for our Spreadsheet. On the Page Setup dialog box and on the Margins tab, and under the area named Center on Page, we can also adjust how our data will be displayed on our Spreadsheet when we print it. We can Center on Page our data Horizontally and Vertically just by activating the appropriated check boxes next to the commands. All the adjustments will be visible only in Backsgtage View or on the printout version. Whatever changes we do, we have to press the OK button at the end in order for all the adjustments to take place. 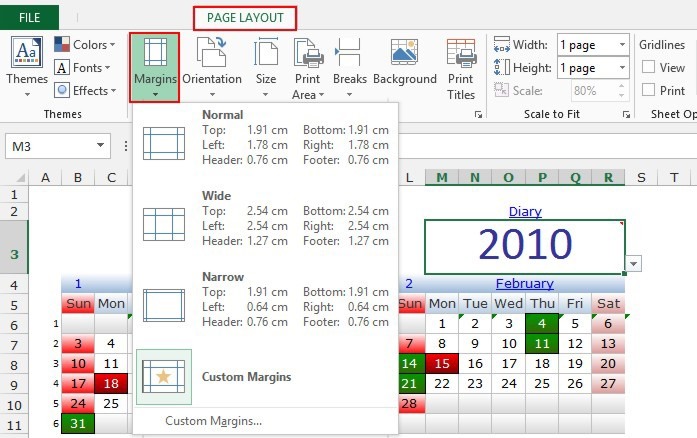 Below you can check out the video describing how to change the Margins of our Spreadsheet in Excel 13. Posted on April 22, 2015, in Excel English 2013, Microsoft Office 2013 English and tagged Center on Page, Change Margins of our Spreadsheet in Excel 13, Custom Margin, Horizontally, Margins, Microsoft Excel 13, Microsoft Office 13, MVP, Narrow, Normal, Office System, Page Layout, Page Setup, Smart Office, Spreadsheet, Vertically, Wide. Bookmark the permalink. Comments Off on Changing Margins in Excel 13.